Goldilocks & Her Doodle: Buyer Beware! When I was a kid, and I got to stay home from school because I was sick, it wasn't such a bad thing. My mom would dote on me all day long from my vantage point on the sofa plopped in front of the TV. If it was a Wednesday, my dad would be home too, so the house always had an energy about it. Yesterday I stayed home sick from school, and it was quite the different experience. I felt like it was a big, inconvenient break in my agenda -- Milt was supposed to be at daycare, me school, followed by evening yoga. Instead, I spent the day at home in my pink bathrobe (you know the one I am referring to). That morning I had awoken with a gurgling stomach followed by the sudden and frequent urge to rush to the toilet. I'm not one to ever take a sick day (it's too much time that I miss with my kids), but the thought of me running to the restroom multiple times in a period, while the students stopped and stared, was unbearable. I have absolutely amazing students, but even I would need to comment on that! The worst part is you are at home on a weekday, which is kind of like a mini-holiday, but you don't feel well -- vacuuming, dusting, and mopping just have to wait. 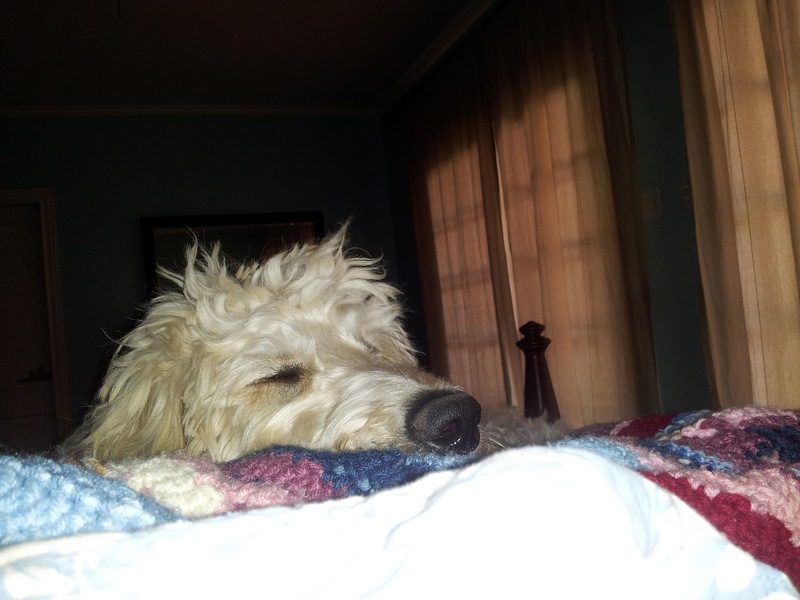 Poor Milt couldn't even fathom why it was 2P.M., Momma was still in bed, and we hadn't even taken our daily walk yet! I felt bad for my boy. I invited him up onto the bed, and this time he stayed around for a solid two hours. He is not a cuddly one up at the head, but he prefers to lie at my feet and stretch out. It is like a barbed wire cut, and it is still quite tender. I have been nursing it with aloe vera, and I am sure that it will eventually heal, but I am a bit nervous about scarring. 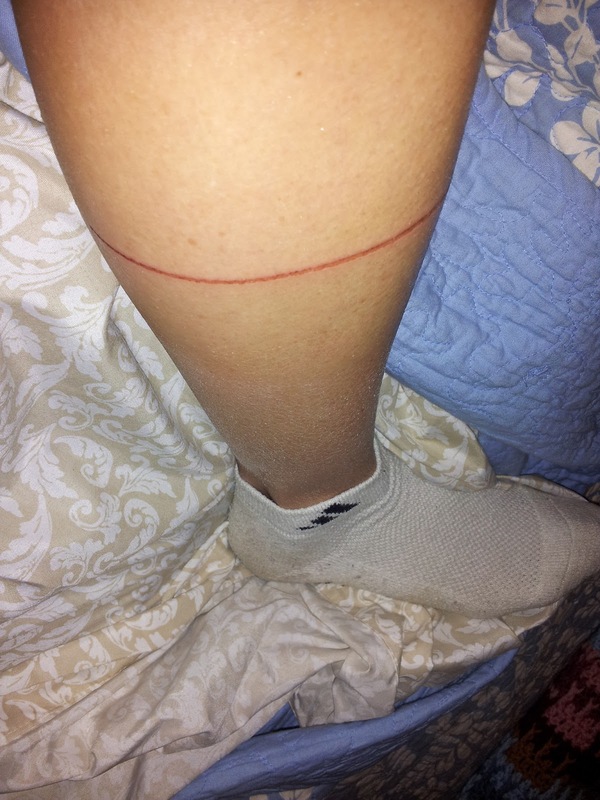 Point being, I do NOT recommend wire retractable leashes -- they are a danger! Have fun this weekend, everyone, and stay safe! ouch!!! that looks so painful. I hope you're back to your fabulous self but my oh my how cute is it that Milton stayed with you knowing you didn't feel good!